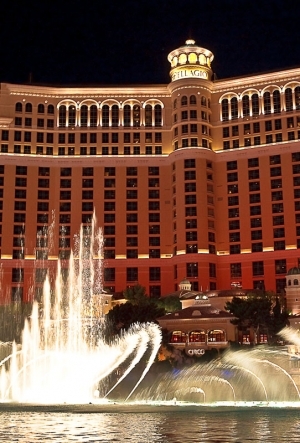 The Bellagio Hotel and Casino, on the Strip in Las Vegas exemplifies luxury and elegance. Winner of the sought-after AAA Five-Diamond Award, the Bellagio's guest rooms and suites are spacious and residential in character, offering views of the spectacular Las Vegas lights, the water-show in the Lake Bellagio and the surrounding mountains of the desert. Your dining experience while staying at the Bellagio includes an upscale collection of fine-dining restaurants as well as a diverse menu of casual cafes. Bellagio Hotel & Casino's nightlife varies from metro cool to jazzy sophistication in a collection of bars and lounges, as well as Las Vegas hot spot, Hyde. The amenities of Bellagio Hotel include a full-service spa and salon, shopping at Via Bellagio, and enchanting year-round heated pools, spas and private cabanas, fitness center, office space, and of course a 24 hour concierge. Hyde is a club where you will experience nightlife like never before while overlooking the stunning Fountains of Bellagio. Each night features a different D.J. which brings a whole new twist to your night, every night! This elegant lounge is a refreshing alternative to the high energy nightclubs. Enjoy an exquisite cocktail menu and music mixed by VegasÂ’ top DJs. Jazz loverÂ’s get ready to enjoy this tasteful, stylish, and sleek atmosphere while sipping on your favorite cocktail. Come grab a beer and watch your favorite teams on the big screens. Get into the action when you visit the betting arena to place your bets! Only HospitalityÂ’s most seasoned mixologists are part of this award winning team. You must stop by and see for yourself.